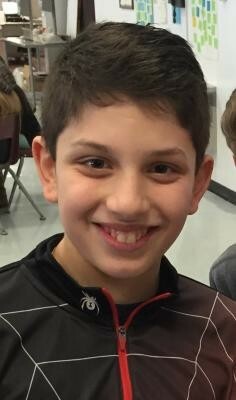 Joseph "Joey" Mariani is a 7th grader at Chittenango Middle School. A Gold Honor Roll Student, Joey is a three season athlete who enjoys football in the fall, wrestling during the winter and track/field during the spring. Joey is running his first Boilermaker Roadrace and chose to raise money for the Veterans Outreach Center, making it a more meaningful experience for him. Joey resides in Chittenango with his parents and six siblings. He enjoys reading, being outdoors, volunteering at the VNA Home care Social Day Program in Syracuse, and working on science and technology projects. Joey is described by all who know him as a boy with a "huge heart" and someone that always is willing and wanting to help others less fortunate than him. Everyone who meets Joey falls in love with his infectious personality and "never give up" attitude. Please help support Joey in his mission in raising much needed funds for the Veterans Outreach Center!